this work was too long for me because the sketch i made it on December and now i make this on digital and took me like 5 or more hours, i finished on 12:20 p.m. too late, all my family sleeping and only me working and this come, this lucario better version i think, what do you think? my opinion is "it really comes with my pokémon i wanted to train" on pokemon y i have two Lucarios and one female Riolu waiting for training. Digimon used mega evolution before it was cool, lol with the meme thing. PD: PLEASE DONT USE THE WORD "DUDE" FOR ME IT REALLY OFFENDS ME BECAUSE I AM A GIRL. Awesome Mega Lucario you draw, I think I like it. I kno im just write wrong okay?. Epic! I like you colouring style and how some lines are coloured! This is great. Got it perfectly. 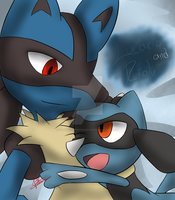 I love Mega Lucario! You capture its essence of seriousness here. Wow, it looks very accurate!